We’ve reduced the number of steps it takes to plan your campaign—so you can focus more energy and resources on actually launching it! Offered more help on running successful coalitions and opposition management. Check out the two new sections filled with tips that will help unify multiple voices—and help you prepare for the opposition before it strikes. We also added ideas throughout the guide to help you infuse smart digital strategies along the way. Included more robust, best practice examples. Version 2.0 features case studies of the best and brightest campaigns from recent years, as well as tips for replicating those success stories within your own organization. We’ve added simpler checklists and Notepad space to help you think through each section of your plan with your colleagues, allies and stakeholders. It will make it easier to share ideas with others, and help make sure nothing slips through the cracks. Our new site is tablet-friendly, so you can access it and update it while you’re on the go. Pick the level of detail that works best for you, and download a plan that matches your needs. You can even export your plan to Google Docs so that you can share it—and any updates—with the entire team, in real time. Throughout the guide, you’ll have the option of digging deeper into specific areas with tip sheets, case studies and other resources that will help you address unique challenges. We'll also update the research and examples over time, so you always have exactly what you need to put a winning campaign in place. Moving forward, we’ll showcase new intel and insights from other great campaigns. You can also recommend new research for us to feature or share your own campaign wins in the Toolbox. Be sure to click to receive notifications when you register so you’ll be in the know every time we add new material. We didn't make this up. We’ve studied and led dozens of campaigns, some we’ve won and some we’ve learned from when we lost. 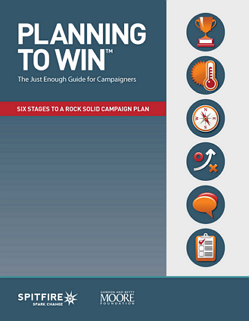 We’ve asked bona fide experts who have won a campaign or two (and lost others) to describe what they have found are the most critical planning elements—the must haves rather than the bells and whistles. Everything we’ve learned is shared here. We left plenty of room for flexibility and creativity. This guide doesn’t constrain the creative process; rather, it organizes your creativity in a way that channels your best and smartest ideas to help you achieve your campaign goals. It lets you build your campaign your way. We kept it as simple as possible. We know that a successful planning guide can’t burden you with so many steps that you start asking, “Are we there yet?” We’d much rather help you on your way, not get in your way. So, by the time you finish Planning to Win, you’ll have a customized plan that you can put into action right away. Best of all, you’ll have proven tips and tools at your fingertips—along with enough energy left over—to cross the finish line. Find and share helpful resources. View a print version of this guide.